I almost just completely forgot about the most obvious backyard edible of all.. at least if you live in the north east USA. Black Raspberries!!! Black raspberries also known as black caps are wild growing in most parts of the north east. They are related to regular raspberries but smaller and sweeter. They grown on thorny bushes and turn black when ripe. We pick them every summer sometimes by the bag full. Bug looooves them just right off the bush, but they make excellent jam, jellies, and pies! Aside from being delicious though they have been found to possibly cure bowel cancer. 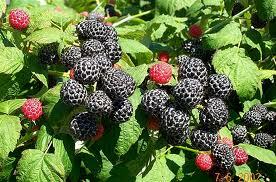 An article I found said that freeze dried portions of the black raspberries have reduced bowel cancer in mice. So just another great backyard edible!! !